Review: I first learned about John Lewis’s March series through its Free Comic Book Day issue. I read it, got hooked… and then forgot about it for a year. But then a month ago at the library, I found all three books from the series chronicling John Lewis’s life and work in the Civil Rights Movement, and I ended up reading them all in one go. They were that good. The art is powerful, as is the story of how John Lewis grew up to become an important part of the fight for civil rights in the 1960s and onward as one of the Big Six who organized the March on Washington and the chairman of the Student Nonviolent Coordinating Committee. The books don’t shy away from tough topics and imagery such as racist violence and death, but that made the March series all the more compelling in its accuracy. 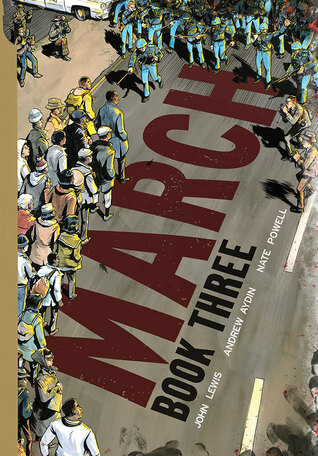 March: Book Three focuses on the latter part of John Lewis’s career and work as he struggled with others to gain voting rights for the African American community. It details how he looked for a way forward for the movement in the face of political and local pushback. It’s an eye-opening view into how activism and organizing works, along with the shameful role the American government played in blocking progress. I honestly believe this should be required reading in school — and in life. Given the recent elections, the 2013 gutting of the Voting Rights Act, and rampant voter suppression in America via voter ID laws, the March series is more relevant than ever. Recommendation: Buy it now! And watch this powerful speech by John Lewis during the National Book Awards.